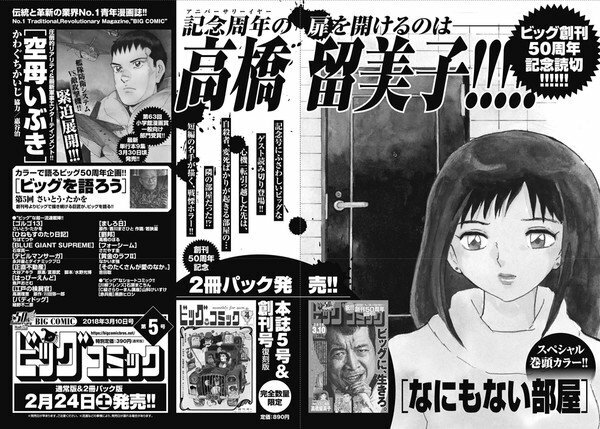 From the latest issue of Shogakukan’s Big Comic magazine, the publication announced over the weekend that it will launch a new one-shot manga by none other than Rumiko Takahashi, and from the looks of it the material seems to stray a bit from her usual works – which got my interest even more. The new material is called “Nanimonai Heya” (Empty Apartment). The story revolves around a character follows someone who looks to have change of pace in life and part of it is moving to a new apartment, little did he know that the place has a history of suicide unexplained deaths. For those who don’t know Rumiko Takahashi and her works (by the way you really should), you might be familiar with some of her popular creations such as Ranma 1/2, Inuyasha, Urusei Yatsura and Maison Ikkoku, to name a few. Her latest work, RIN-NE, recently concluded last December. Nanimonai Heya (Empty Apartment) releases this year, February 24. Previous articleListen to Kingdom Hearts III’s new theme from Utada Hikaru! Next articleLondon Spitfire makes an AMAZING comeback! Overwatch League Stage 1 Playoffs recap!